Americans work the longest hours, and are totally fat, but we've got bragging rights about other stuff. Like, Hulk Hogan's entrance music. And having the best passport in the world. That is, according to Passport Index, a website that ranked all the world's passports based on where they can get you. An infographic that surfaced last year shows similar data, but Passport Index allows you to organize by color, which is great if you're OCD and interested in passports. The image of all those blue passports together will leave you feeling at peace. 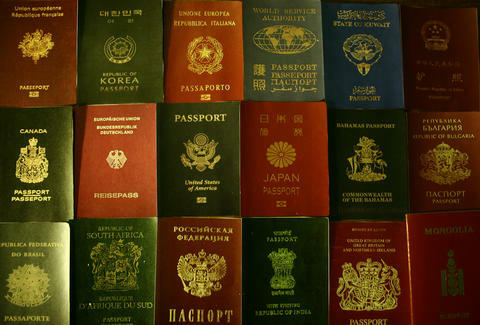 Passport power ranks were decided based on how many countries holders are permitted to visit. The US and the United Kingdom tied at no. 1, able to visit a whopping 147 countries. France, South Korea, and Germany were placed in the no. 2 slot, with access to 145 countries. Italy and Sweden come in third at 144 countries. Passports that wield little travel power include the Solomon Islands, Myanmar, South Sudan, Sao Tome and Principe, and the Palestinian Territories. Holders of these passports can only get into a sad 28 countries, the fewest of all passports included in the study.